So the big day has arrived: your first job interview! It is pretty exciting, scary, daunting, and exhilarating all at once. The time you spent networking, writing a resume, crafting a cover letter, and getting it front of human resources at a company where you would like to work has paid off. You have a date with hiring manager. Just like all dates, though, there is a lot at stake. Instead of a peck on the cheek after a movie, however, you are looking for another date in the form of follow on interview or maybe a long term relationship in terms of a job. Also just like hoping for a peck on the cheek you must make sure that you everything right, because if you don’t you will be back to square one with nothing to show for your efforts. In order to make the best impression it is important to show up for the interview as prepared as possible – everything from how you present yourself to how you speak to how you think on your feet. To make it a little easier, I’ve broken down the traditional interview into four segments: research, preparation the interview, the interview itself, and followup. First off is continuing your research. You have already submitted your resume and it resulted in a call for an interview- good job! Now you need to refine your research into how to successfully complete the interview. You can search the net for general interviewing tips, but you will be better served to go to a site that provides real insight into company-specific interviews. My favorite is glassdoor.com because interviewees post their interview experiences, including the types of interviews, questions, and how things went. It is well worth a few minutes of surfing to see what you are up against. You should also ask around. Use your network to see if there is anyone who has interviewed with the company you are looking to join or who has interviewed at a similar company or for a similar job. They can provide a lot of insight into the process – especially if their interview landed them a job! Practice answering questions. The questions can come from your research or from the items on your resume. After all, the company called you in because they found your resume compelling. You should study your resume and think about what an interviewer may hone in on, and prepare for questions along those lines. Transitioning military folks always have “leadership” in their resume, so you had best be prepared to talk about it! Whom did you lead? What techniques or skills did you employ to get people to do what needed to be done? How will your leadership experiences transfer to the company where you are interviewing? Ask a friend to go through a mock interview with you. Give them your resume and a printout of your research findings, and ask if they will be gracious enough to spend some time helping you practice. If you have the time, I would recommend that you do a full blown rehearsal – including wearing your interviewing suit and sitting on opposite sides of a desk. Rehearse the whole process, from arriving at the company to saying goodbye and leaving the building. If you practice it all once or twice you will reduce your anxiety and be better focused on the interview. Remember, the interviewer is taking everything in from your appearance to your habits to your level of anxiety, and if you are too uptight or nervous it will not bode well. Now you are ready for your interview. Before you go, however, there are some basic things that you should do. In the military, you prepare for inspections in a disciplined and results-oriented manner. When you have a uniform inspection coming up you spend a lot of time making sure that your uniform is correct; you measure out where the ribbons and badges are placed, cut off any spare threads (Irish Pennants for you old-schoolers), and press in creases so sharp you can shave with them. Shoes are shined and the edge of the soles are dressed to remove any scuffs. You get a haircut the day before the inspection to make sure that your grooming is within the required standards, and then you ever so carefully get dressed and present yourself for the inspecting officer or NCO. You should approach your job interview with just as much attention to detail. Get a haircut the day before. Critically look at your clothes- they should be either fresh from the cleaners or at least have all of the wrinkles pressed out. Your shirt should fit and your necktie should be professional looking, clean, and conservative. Shine your shoes! Even though society has largely moved away from shoe shining as a daily task, I know of one executive who was promoted over three more qualified peers because because he took the time to shine his shoes. It shows dedication to your appearance and the discipline to do the little things, both of which are a big plus in any line of work. Leave for your interview early. Make sure that you allot enough time to be at least ten to fifteen minutes early. I recommend going at least an hour early and stopping by a coffee shop near the company’s office. That way you will have plenty of time to spare for traffic or to take care of things you may have forgotten (like putting gas in the tank). When you get to the coffee shop you can review your notes, have something to drink, and get your mind right for the interview. 1. The interview is the result of all of your hard work up to this point- don’t wreck it with a poor performance! Follow these four steps: Research, Prepare, Attend the interview, and Follow Up. We talked about researching and preparation in this post, and in the next post we will address the interview and followup. 2. Treat the interview like an inspection- get the little things right and the big things will take care of themselves. Look at your clothing as you would your uniform and square it away as you would for your Commanding Officer. 4. Rehearse with a friend ahead of time by using questions garnered through your research as well as your resume. Be ready to answer questions by practicing ahead of time. 5. Head to the interview early, and use the extra time before you go through the company’s front door to prepare, reduce your anxiety, and make sure you are ready. 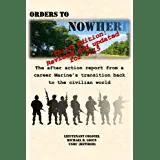 This entry was posted in Military Transition, Transition Posts and tagged active duty, career, EAS, Employment, Job Seeking, Leadership, Marine Corps, Networking, Resume, Retirement, transition. Bookmark the permalink. Some really prize reports on this site, saved .